Allen Crawford is an artist, illustrator, designer, and writer. Under the nom de plume “Lord Breaulove Swells Whimsy”, Allen wrote, designed, and illustrated The Affected Provincial’s Companion, Volume One (Bloomsbury 2006 [US/UK], Metrolit Verlag 2013 [GER]), which was optioned for film by Johnny Depp’s production company, Infinitum Nihil. Allen’s award-winning book, Whitman Illuminated: Song of Myself (Tin House Books [US], Jonathan Cape [UK]) is an illustrated, hand-lettered, 256-page edition of Walt Whitman’s epic poem. The book has won wide acclaim, including Best of Show in 3×3 Magazine‘s International Illustration Show No. 12, and a Gold Medal from The Society of Illustrators. 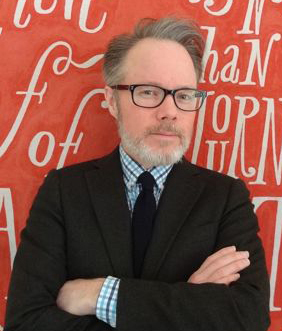 Allen and his work has appeared in Communication Arts, American Illustration, Type Directors Club, Print, Applied Arts, The New York Times, Interview, Orion, Frieze, Vice, Tin House, and Art in America. A lifelong amateur naturalist and conservationist, he is currently assisting filmmaker David Scott Kessler with his experimental documentary film, The Pine Barrens. Allen lives in a small Quaker town in central New Jersey, just outside of Philadelphia.